^^^ Maybe because he needs urgent money and the loan-sharks are still behind him? Doesn't he know that a marriage is a potentially expensive event without any quick profit? I don't believe you. If you really loved me you wouldn't ignore me for such a long time. Am sorry. But I did that before because we couldn't understand each other. I could understand you perfectly. You didn't want to be with me anymore. You abandoned me. It was very clear to me. What does your sorry mean? Did anything change? Do you want to make effort to be with me or are you still there doing nothing at all to come to England? Sorry is just a word. Without actions it doesn't mean a thing. Of course am always there an ready to be with you. But unless when you help me. Am still here suffering like the way you left me or even worse in conditions. How can I show it you Emma. Am sorry I can't do it Emma. Then what is it that you expect from me? You're doing it again. Abandoning me just like that. Tell me Cherno, why did you even contact me again? And I need a proper apology to be sure of that. I don't want to waste my time any more if you are not serious about us. So make a video with a proper apology so that I can believe you. He still hopes to take some easy money from you. That's all. Ask him if he was in Dakar, to get the money from the hotel manager. I'm sure it will be a great pleasure for him to enjoy this wonderful memory. If I were Emma, I would tell the video is needed not as a proper apology but as a proof that no impostor tries to defraud her, because there are a lot of Chernos writing her and telling similar things, and there is no way to determine which one is real. I can see you abandon me just as easily as before. Please tell me Cherno, did you make arrangements with Mike yet? I get emails from other email addresses with the name Cherno in the last few days. Do you have any idea what's going on? It's been a long time now and the money is still waiting for you in my safe. Are you planning to pick it up any time soon? May God bring you to Gambia emma. I cry I can't stop crying. If you want to be with me you know what to do. I left the money in the hotel in Dakar. All you have to do is contact Mike to make arrangements to pick it up. As far as I know it is still there. Am okay with that money. We will meet one day. I will be very grateful if you come to Banjul. Really! But hadn't been you are here everything is okay. Emma please come even you don't come with no money is okay just come I want to see you. May God guide you one day you will regret what you are doing to me just keep on following satan footsteps. Because I don't want to travel to Gambia? Where I have been abducted, abused, where you refused to meet me at the border? Is it so strange now that I don't want to go there again? It's your turn now. I made it possible for you to come to England. I left so much money for you and you refuse to come to me. That says more about the one you are following. Emma: Why do you keep contacting me if you don't want to come to england? 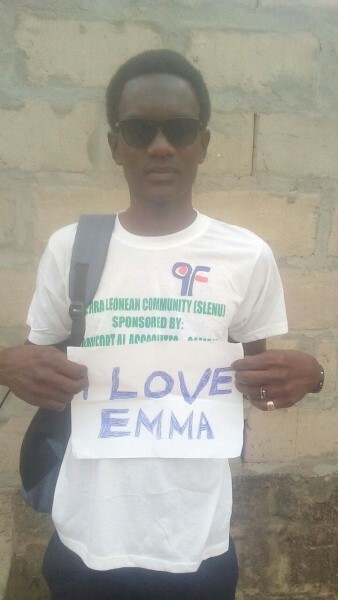 Emma: so much that you abandoned me in basse and left me in karang? Emma: you want me to come to banjul. I will not do it. Who says you won't leave me there again? Cherno: You can fool me but you cannot fool God I don't want to marry you Emma. I don't need your money. The world is a circle. One day you will under my arms. I knew him very well and his parents just like he do. Emma: so why are you angry about that? If you weren't convinced yet why scammers are dangerous, here's a show. He's finally showing his true colors. He only tried to get Emma to Gambia for one reason after he failed to get her money, and the reason is not pretty. Cherno: You will one day do it without your intention. One day I will grib you with my hands together then you regret why you were created. I will tortured you to death trust me. Emma: And finally your true identity shows. Cherno: If you think you have escaped from me you are joking. The friend, not much interesting chat, I think he's an ITP so I ignore him most of the time. Just when I was beginning to warm to Cherno he goes and acts like that. He's always been a nasty tempered little rat. It doesn't really surprise me to read his vengeful threats of torture and death. ... If you weren't convinced yet why scammers are dangerous, here's a show. He's finally showing his true colors. He only tried to get Emma to Gambia for one reason after he failed to get her money, and the reason is not pretty. Our little idiot trying to be a dangerous man? I think the loan-sharks from his village have made Cherno's life very, but very hard in the last few months. Emma: wow, what happened to asking? Cherno:Will you come after that to Gambia. Hello Emma I would be very grateful if you appreciate this photos. That's the shirt I wear the time were welcoming him to the airport. Emma: It's in Banjul, where you live. How difficult is that? Emma: what are you doing there? I think is better you understand what am saying. Cherno: Where are you working now? Am now working as a local night watchman. 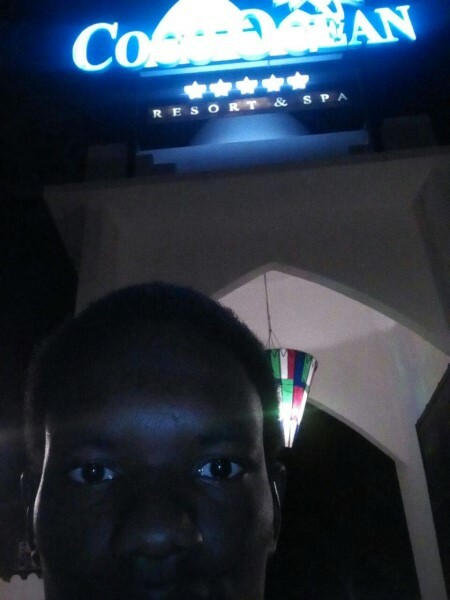 Am a night watchman in resident just near the hotel you are talking about. Please don't bring misunderstanding here. Emma: I can't even see that is you, and I can't see a building that would be recognizable, so how will this prove to me where you are? Emma: and you were in brikama you said? Emma: brikama is in serekunda? Cherno: Yes is just like when you say uk. Emma: then why didn't you tell me you're in serrekunda? Please let's solve this problem now. We should solve this problem now so that everything is OK.
Emma: I want to, and because I wanted to solve our problems all this time I have left the money in the hotel for you to pick up. The manager even agreed to bring it to the old airport so it would be closer, but you don't want it. What do you want from me if you will not accept my help? Cherno: Am not going to dakar I have told you that several times. All I want from you is to be with you forever. This life we are living is very short if only you knew in order to catch up with it we need to fast enough. Don't live in England just like you have not left someone behind you. Emma: Why noy? Do you think it was fun that you left me? Even if it will take some years to meet you I promise to marry you no matter what happened. I always believed that in my heart that my wife is in uk. Emma please just believe the same thing. Please always believed in your heart that your love one, cherno is the Gambia. Don't worry easy those it. Emma: Why? Cant handle the truth? Emma: Then what do you call it? You decided to follow jesus an pera. Emma: Then why do you refuse to come to England? Cherno: I don't refused to come my darling easy those it. Think about what you say, "come to England"
If you want me to come over there. Come an pick me up immediately Emma. Cherno: I have told you I can't do that Emma. Emma: then what do you expect from me? Cherno: that I have the funds to keep traveling back and forth? Cherno: Is sad to me when I remember those pictures. Without patients we cannot see see each other. Cherno: I have told you several times am not going to Dakar. And he blocked Emma... I think this profile will soon change into a woman, just like his others. He's a weird little tyke, this lad. I think he's mostly in trouble because he owes people money and either still wants Emma's money or want her to come to Gambia for some revenge. I'm so happy to hear from you. Are you ok? Why did you block me on messenger again? Yeah. Am OK, because I want us to chat on email. please let chat on emails. OK! I understand my sweetheart how are you doing over there I hope you are fine. Why are you not replying my messages emma. Why are you ignoring me tell me. And please always believed in your heart that my sweetheart cherno is in the gambia. Am fine an you. How is work. Don't worry one day we'll be living together with a our kids as a family. Thank you so much please always remain happy at all times. I am OK here nothing is wrong with me iam healthy enough. Just continue to work hard an save more money to come to the Gambia next time. Then it will take longer time for us to meet. Emma please reply me. You are making me to cry. Ok forgive me please don't leave me Emma. You didn't travel because of me if you do why do you refused to take my advice. You are a great liar an a wicked woman. You should at this time carrying my baby but you refuse. Yeah but you can come again. I will immediately go an pick up the money if you send me your pictures or your video of own self. Because I don't know you I only see your profile then how can I fully know that am talking to the right person. without your video of your own self am not going anywhere trust me. Who are you emma show your self to me. Here's one from my vacation a few weeks back. Hope you like it. Is beautiful. but it seems you are in the middle east. Really. But spain is not sundy like this Emma. I can see that you a very tall woman. But I think I am taller than you Emma or may be we are equal in height. Really. OK then send me fair to go an pick up the money. Emma if really you want us to meet you have to sacrifice an send me fair if not am not going anywhere trust me. In fact this is nonsense just come to Gambia. You think he'll pick up the money for you? Be serious. You're the one that has to do that. If you really don't want to be with me then please stop torturing me. So it has always been about the money? You never really loved me? Talk to me Emma please. I love you so much the mother of my children. What is it that you want from me today? I want you to kiss me Emma. Of course you are the one that call me this morning Emma. I just couldn't able to store the number please send me your number I will call you back. Please Emma call me back. Their is no errors on me Emma. Please reply my messages Emma. Please Emma reply my massages don't ignore me. I think is better I kill myself Emma please call me back. Am crying I can't stop crying out loud at home. Please send me your phone number I will immediately call you back. Please Emma call me back or send me your number I will immediately call you back after work. OK! just give me a call I will definitely do whatever you say. Emma tell me which method so that I can use it please. When we have children I will tell them the stories I passed through with you Emma. "Of course I love you so much Emma even without money or any material. This is why I say come to Gambia even if you bring nothing is ok I just want to see you an to live with me. Love is not about money Emma "
I almost forgot the bipolar behavior of this poor idiot. It is useless to look for logic or arguments in all its words. Well done! Perhaps that hotel manager (Mike) has a group of tourists who just come back to their home, in the Gambia? - Of course, the hotel's van brings them up to the border area (in Karang). - As a gesture of goodwill, the manager Mike could accompany the group and take with him that envelope with money. - Of course, Cherno has to agree to pay this service (the manager wants a $ 1,000 bribe). Perhaps a journey to the border seems more feasible for our idiot. I certainly think that Emma could remind him that she lost fingers as a result of trying to hook up with him, for which he accepted no accountability. Perhaps she might rub it in that she's still not at all happy about that. Most unreliable and uncaring future husband living in a dangerous, unpleasant part of the world. Birlic, I like that idea, right now we're at the point of insults again. He thinks Emma is married to her friend, the girl that contacted him when he blocked Emma. I actually enjoy his bipolar moodswings. And then realise that those messages come in quick succession. He hates Emma and within 15 minutes comes to his senses and says he loves her. I think that's the only part of this that is still amusing about this story and why I keep responding. I know the money in dakar is driving him insane.